The SAR Table app is going through some major improvements at the moment. Earlier this year, the matrix view feature was introduced, which allows two properties (e.g. scaffold, R-groups) to be plotted against each other in a grid, with one or more properties represented with colour coding for easy recognition, such as shown on the top right. 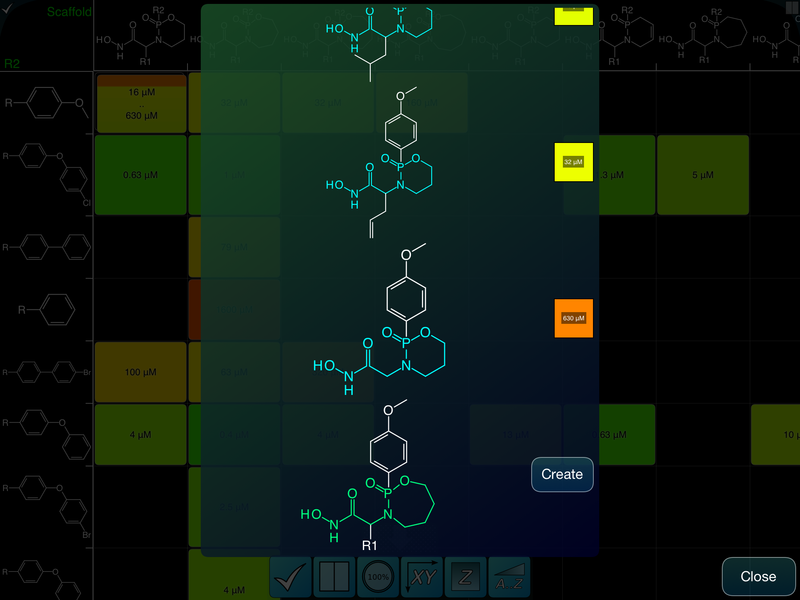 In the currently available version, the matrix view is essentially read only, although it has nice features for picking axes and sorting, displaying multiple responses, and also allows displaying predicted properties for any cells that represent compounds with missing data. On the drawing board for some time, though, has been a feature to make it really easy to create new records corresponding to a selected cell. 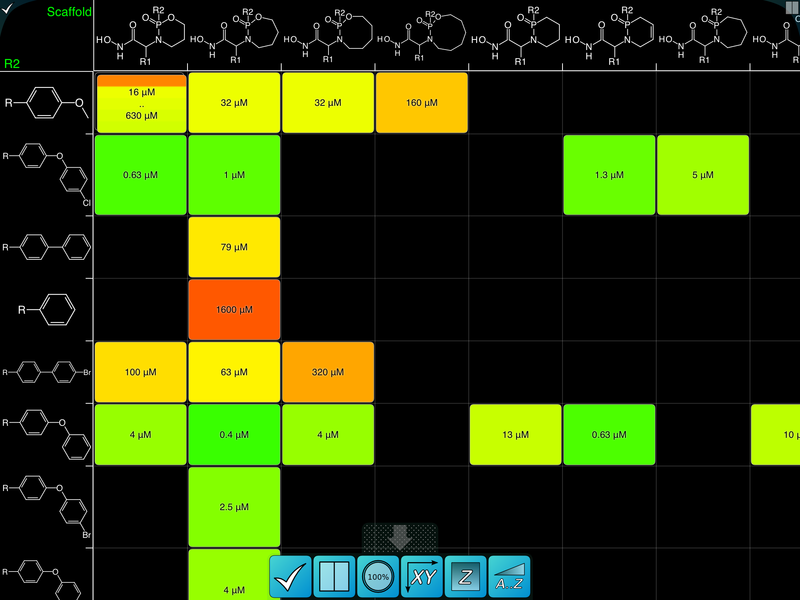 The overlay shows a scrollable list, which makes it easy to see which compounds are represented by the cell. The scaffolds are highlighted in turquoise, and the activities are shown to the right. But notice the last entry: this one is only partly defined. The R1 substituent is left as a template placeholder, because the view currently defines the intersection of scaffold vs R2, leaving R1 as a degree of freedom. This is not a row from the SAR table, rather it’s a virtual entity, and it comes with its own button called Create. Tapping this button will add a new row to the datasheet, filling in the known values (scaffold, R2) and leaving the rest blank. The rationale here is that when you see a cell that is not represented by a compound (or not by enough compounds), you can use just a couple of taps to create new template starting points. If your SAR data is telling you something interesting about which fragments are the causes of activity or lack thereof, the matrix view can be an effective place to identify new compounds that are likely to be worth making an testing out. Or at least running a prediction first. The next version will receive a few more features before it gets submitted, it’s not quite ready to send in yet, so stay tuned to this blog. Unfortunately my productivity in terms of lines of code per hour isn’t at its usual cruising speed thanks to the latest strain of influenza making its appearance in the inner suburbs of Montreal, but hopefully there will be something to use quite soon.